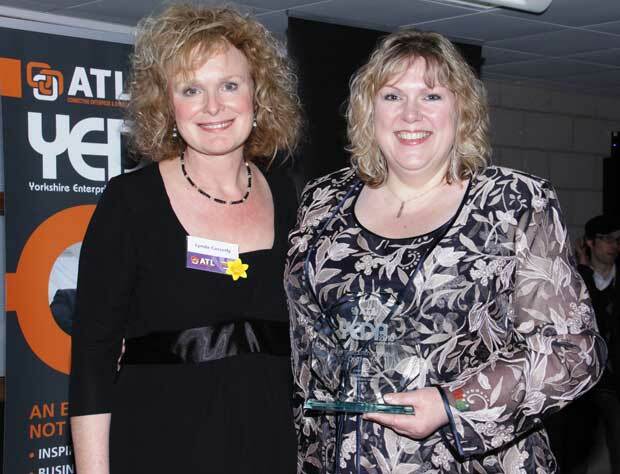 I'm still not quite sure how it happened, but in March 2010, I was fortunate enough to win a prestigious award and become Female Entrepreneur of the Year at the South Yorkshire Enterprise and Diversity Awards evening. Organised by ATL (Yorkshire) Ltd, based in Bradford, five YEDA awards events covering the Yorkshire region were held to celebrate business enterprise and were sponsored by Business Link, Yorkshire Forward and UK Trade & Investment. The South Yorkshire presentation evening, held at Sheffield Hallam University, was attended by over 150 local businessmen and women, all hoping to win one of the coveted awards. Shown presenting me (right) with my award is Lynda Casserly, formerly of ATL. The gorgeous glass trophy now takes pride of place in my studio!